Producers Jeffrey Seller and Cameron Mackintosh have today confirmed plans for a £10 daily lottery for Hamilton tickets in the West End. The ticket lottery will open on Monday 4 December 2017 for the show’s first performance at the Victoria Palace Theatre on Wednesday 6 December 2017. Theatregoers can apply for a maximum of two £10 Lottery tickets via the official Hamilton App or online. Each lottery will open at 4pm, and then close at 2pm the following day. Within an hour of each lottery closing and after the random selection of winners, all entrants will be notified, either through the app or by email, with successful entrants receiving details of how to claim and pay for their lottery tickets. To download the app or for further details, prospective applicants should visit the Hamilton website. Lin-Manuel Miranda’s book, music and lyrics have proved a global sensation, and its West End debut is highly anticipated. Hamilton is set to reopen the newly rebuilt and restored Victoria Palace Theatre next week, with previews beginning on Wednesday (6 December 2017). The official opening night will take place on Thursday 21 December. 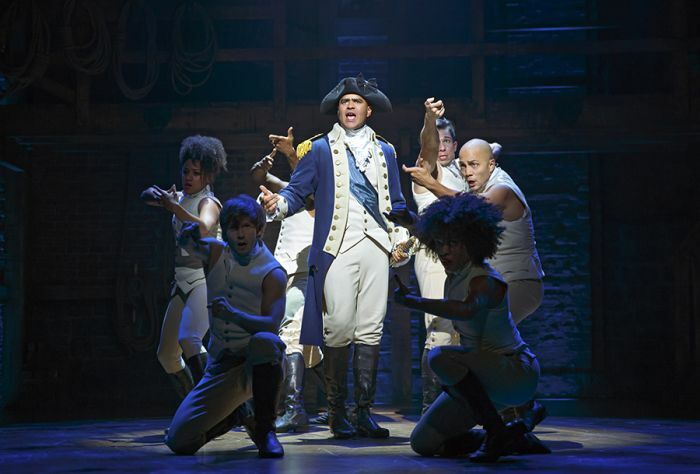 Find out more about Hamilton in the West End.